Last week, with the Misses away on holiday in the Greek islands, I decided to treat myself to a taste of Greece right here in Brno. 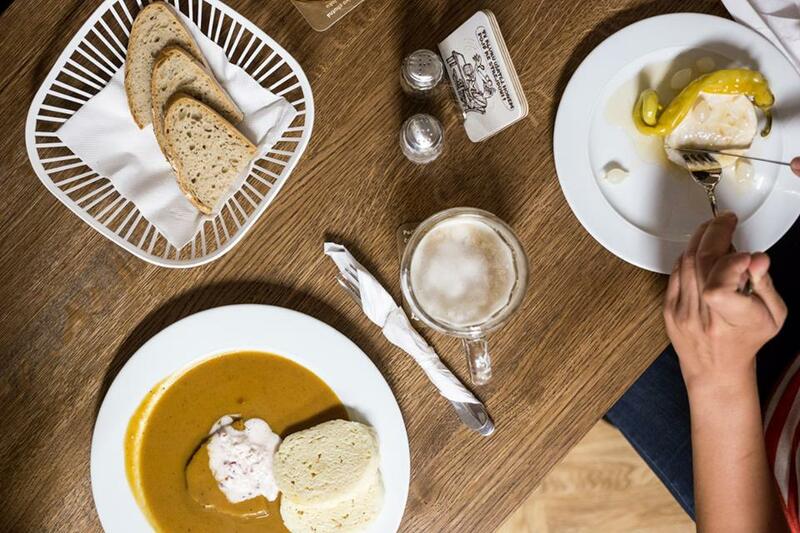 With the newly opened Cosmopolis Greek Grill, the options for Hellenic delicacies in Brno have expanded. However, its status as the new kid on the block made me think twice. So I decided to give them more time to bed in and iron out any kinks, instead opting for the tried and trusted Ellas. As hinted above, this was not my first visit to this taverna-style establishment. But never have I been disappointed, and so I believe Ellas deserves recognition in this blog. Interestingly, Greeks, like the Vietnamese, constitute another of the Czech Republic’s sizable communities. Thus it should be no surprise that delicious Greek food can be had here in Brno. But at Ellas, the connection to the motherland is apparent in much more than the food. The owner and chef is Greek, and the name itself means “Greece”. The décor is dominated by the blue and white colors which typify the Greek islands. The exposed beams add to the charm, giving the impression of being inside an old ship. Greek music in the background completes the taverna atmosphere. As did a neighboring table of Greeks celebrating a birthday during my recent visit. Opa! One other point about the interior that should be mentioned is that Ellas does have a smoking section. For those smokers out there, I suppose that could be positive news. If like me, however, you’re not such a fan, fear not. I can’t say that I noticed it whilst dining across the way in the much larger non-smoking area. And in any case, the food really is too good to pass up and the staff are very friendly and welcoming. Having been teased with images of grilled meats and other Greek specialties, I already had in mind what I would be ordering. To start, the feta-psiti is always a good choice. A solid block of feta cheese is baked with tomatoes, green peppers, and seasoning, forming a salty molten delight. You’re sure to want to order extra pita with which to mop it up. Unable to decide exactly which grilled meat to have, I opted for the mixed souvlaki plate. This dish boasts 3 skewers of grilled perfection – pork, chicken, and (by the beard of Zeus, yes!) bacon-wrapped chicken. The skewers are served with a tart tzatziki sauce, thick-cut fries, and pillowy pita bread. All three meats were tender and contained a lovely char. The fries and pita also appeared to have benefited from some time on the grill, which may sound unusual for fries but works a treat. The menu can also easily accommodate larger groups wanting to turn on the Greek style by dining mezze fashion – sampling and sharing a selection of different plates. 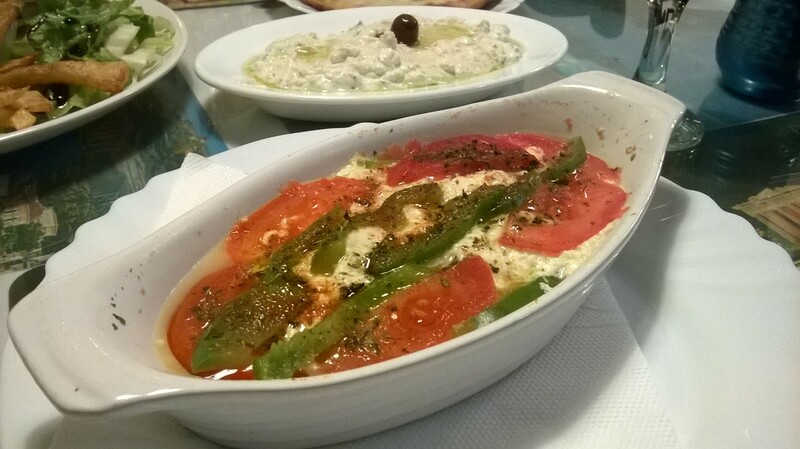 Other delicious dishes to choose from include saganaki and haloumi (fried and grilled hard cheeses), dolmades, Greek salad, moussaka, and various lamb specialties. To wash it all down, Ellas has Poutník on tap as well as some nice Greek reds and whites. Or, if you need something stronger to aid digestion after such a substantial meal, why not have a shot of ouzo? Jamas! Though I didn’t make it to Greece this summer, for a few moments at Ellas I almost felt like I was there. Svíčková na smetaně or bulls testicles? I decided on the svíčková because it’s the daddy of Czech cuisine and, besides, I’d already had bulls testicles 5 times that week. Seriously, though, if anybody has ever had them please let us know in the comments section.